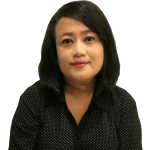 Ilma is the executive assistant at BGA Indonesia, where she is responsible for supporting the Managing Director, and for overall office administration. Before joining BGA, Ilma worked for 10 years as Executive Assistant to the Managing Director at Ogilvy and Mather Indonesia, an international advertising agency where she was responsible for providing key support in the areas of administration, expatriate documentation, ad hoc projects and secretarial duties to ensure the office’s operations ran smoothly. Earlier Ilma worked as secretary to the executive director of The Borneo Orangutan Survival Foundation, an Indonesian non-profit organization dedicated to the conservation of the Bornean orangutan and its habitat. From 2002 to 2006, she worked at PT. Perdana IMMG Indonesia, a company focused on cartoon television program syndication, merchandising and licensing. Ilma holds a diploma degree from ISWI Secretarial Academy in Jakarta.